The New York State Department of Transportation recently announced the start of construction on a $6.3 million project to rehabilitate seven bridges on northbound Interstate 990 in the Town of Amherst. The project will enhance safety and improve driving conditions on a vital roadway that handles up to 65,000 vehicles a day and connects Interstate 290 with the University of Buffalo North campus and other points west. Once completed, the rehabilitated bridges will help ensure the continued flow of people and goods through the region and promote economic growth for years to come, according to the state Department of Transportation. 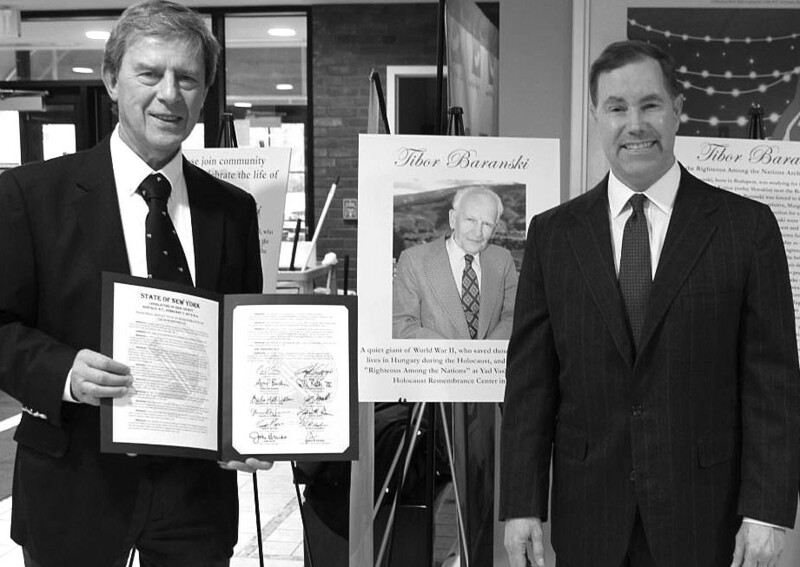 Presentation Held in Memory of Tibor Baranski Sr.
Erie County Legislator Ed Rath is shown with Tibor Baranski’s son, Dr. Peter Forgach, left, who was presented with a memorial proclamation, honoring his father, during a community event on April 11. Erie County Legislator Ed Rath, the Jewish Community Center of Greater Buffalo and Holocaust Resource Center of Buffalo joined together to host a celebration of life and presentation in memory of Tibor Baranski Sr., who died in January 2019. The celebration took place on April 11 at the Jewish Repertory Theatre of WNY, at 2640 N. Forest Road. Baranski, who raised his family in Buffalo, saved 3,000 Jewish lives in Hungary during the Holocaust. According to Rath’s Office, Baranski was named Righteous Among the Nations, an honor used by the State of Israel to describe non-Jews who risked their lives during the Holocaust to save Jews from Nazi extermination. Principal Deborah Lester and Rev. Jerry Kopec recently announced that Melissa Lindner will assume the role of principal at SS. Peter and Paul School, effective July 1. Lindner currently serves as SS. Peter and Paul’s technology/ STREAM coordinator, computer teacher and librarian. STREAM stands for science, technology, religion, engineering, art and math. Lindner completed the Educational Administration program at Canisius College and holds master’s degrees in both education and public administration. The general fund tax rate would rise by 8.25 percent under the proposed $3.96 million Williamsville village budget for 2019-20. It’s an increase of 32 cents, from $3.88 cents per $1,000 of assessed value to $4.20 per $1,000 next year. The owner of a house assessed at $150,000 would pay an extra $48 in general fund property taxes. The full tax levy, the amount to be raised in taxes, including general and sewer funds would rise by 1.73 percent, to $2.9 million, said Village Administrator Judy Kindron. That’s within the state’s property tax cap. The operation and maintenance rate paid by sewer customers based on water use would rise by 9.41 percent but the rate based on a home’s assessed value for capital sewer projects falls by 31 percent. A rendering shows the new north building of the Albright-Knox Art Gallery as viewed from the covered parking garage. Construction is expected to begin in late 2019. In 2017, after critics came out in force against the Albright-Knox Art Gallery’s plan to create a grand plaza out of its low-key courtyard, gallery leaders and architects retreated to the drawing board. Together with the consulting firms Preservation Studios and PBMW, the New York State Office of Historic Preservation and a subcommittee of the Buffalo Preservation Board, the gallery’s architecture firm OMA hashed out a new plan that sought to address preservationists’ concerns. The result, a radically different scheme featuring a new building on the north side of the campus and a swooping ceiling of mirrored glass enclosing the gallery’s existing courtyard, is on the verge of approval from state and local preservation authorities. 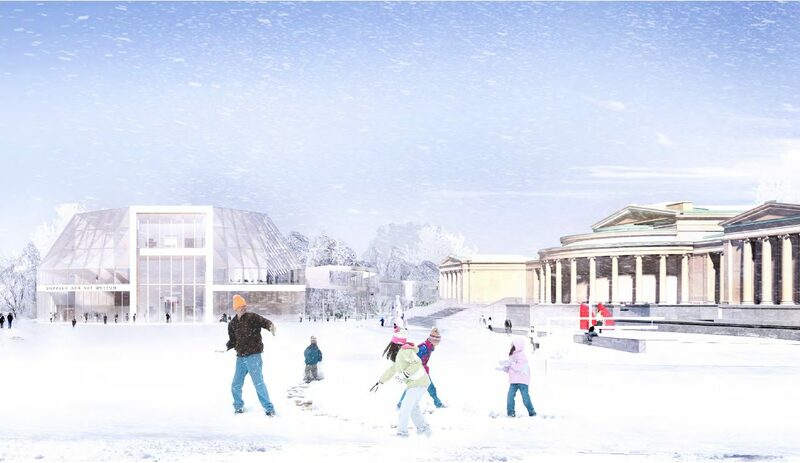 The Buffalo Preservation Board on Thursday heard a 45-minute presentation from Albright-Knox Director Janne Sirén and architects from OMA and the structural engineering firm Thornton Tomasetti about the project. The board approved all aspects of the project aside from the new north building, which will come up for a final vote at the next meeting of the board on May 2. Barring last-minute objections, it is expected to pass. The State Historic Preservation Office is also expected to issue a letter of support for the project. The Public Service Commission announced Friday that it has reached a compromise with Charter Communications to keep its Spectrum cable television and internet operations in New York State. The deal reached Friday appears to have ended a contentious spat between one of the nation’s largest cable companies and state regulators over whether Charter has lived up to its earlier agreement with the PSC to expand its service in rural areas of the state. The disagreement goes back to when Charter first struck a deal with the PSC two years ago to gain approval of its purchase of Time Warner Cable. When does the Jewish festival begin and how is it celebrated? Passover, otherwise known as Pesach in Hebrew, is regarded as one of the most important festivals in Judaism. Every year, Jewish families celebrate the festival by sitting around the Seder table and recounting how Moses led the Jewish people out of Egypt following years of slavery. Passover starts on Friday 19 April this year and lasts for seven or eight days. The festival is traditionally observed for eight days by many Jewish people around the world, including those who left Israel as part of the Jewish diaspora. For those celebrating Passover for eight days, it will end this year on the evening of Saturday 27 April. An employee at work at the General Motors Powertrain Tonawanda Engine Plant. WASHINGTON – President Trump’s new trade deal with Canada and Mexico won’t have much of an impact nationwide, but it would give a boost to some industries that are especially important to the Western New York economy. American auto parts manufacturers and dairy farmers stand to benefit, as do service industries that would find it easier to do cross-border business, according to an independent government analysis released this week that took an in-depth look at Trump’s United States-Mexico-Canada Agreement. The trade deal, which aims to replace the North American Free Trade Agreement, would boost economic growth nationwide by only 0.35 percent, said the 379-page report from the U.S. International Trade Commission. 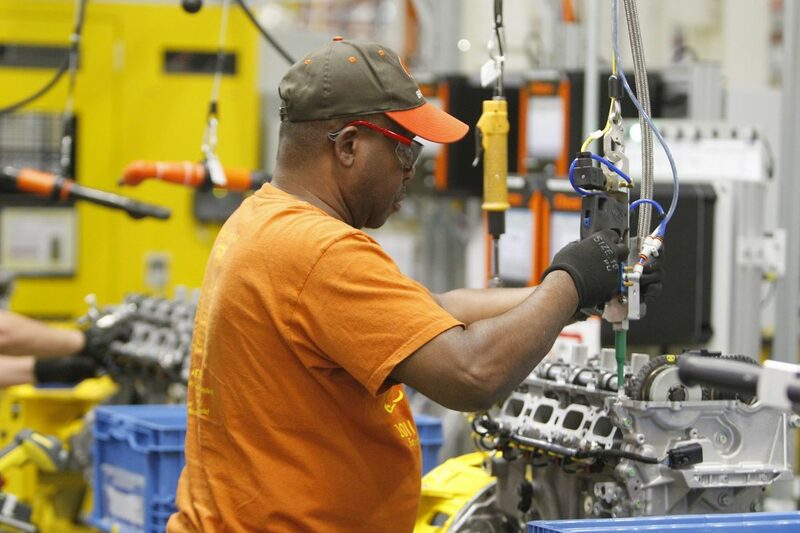 But 17 percent of the job gains – 29,700 new jobs in total – would come in auto engine and transmission manufacturing facilities, meaning those that benefit could include the General Motors Powertrain Engine plant in the Town of Tonawanda. This past Monday’s nights Town Board meeting, 4/15/19, a group of homeowners from the Presidio Street area off Youngs Rd. spoke about a major problem concerning Ash trees which have fallen or which were cut down in their back yards. They have created disgusting looking cesspools. With Summer coming these will draw many different insects including mosquitos and the dangerous West Nile mosquito. Children won’t be allowed to play in many backyards because of the dangers of these cesspools and trees just lying on the ground. Town Supervisor Brian Kulpa stated that he would be hiring a contractor to clean up the mess. He said hopefully the problems which he understood from the homeowners will be solved by August. Kulpa explained that the Town Budget this new Board is working with was the last one our former Supervisor submitted. It wasn’t this Town Board’s budget. Town Supervisor Kulpa is a sincere and trusted man. His word is his bond between the people of Amherst and him. Do you know the easiest way to prevent Lyme disease? Don’t get bit! Ticks are undoubtedly gross. They sink their mouthparts into you and feast on your blood like little vampire bugs – sometimes transmitting diseases in the process. But their inherent ick factor has people on Facebook a little too riled up about the upcoming tick season. The only problem: The accompanying photo is very certainly not of a tick nest, says Robert B. Kimsey, Ph.D, an entomologist with the University of California, Davis specializing in ticks. “Judging by the size of the grass in the photograph on Facebook, the eggs are definitely not tick eggs,” he says. “They’re way too big.” Snopes suspects the viral photo, which actually dates back to 2015, may actually depict frog eggs spit out by an unsuspecting predator. Real tick eggs are so teeny-tiny, the entire batch is only as big as two adult female ticks. They also look more reddish-brown – not black like in the picture, Dr. Kimsey adds. Out of the some 5.5 million insect species on Earth, most lay eggs, he adds. The tick eggs you may think you’re destroying could belong to another species important to your local ecosystem. If you’re really worried about ticks, protect yourself by applying insect repellent and avoiding wooded and bushy areas with high grass and leaf litter, the Centers for Disease Control advises. There’s officially no need to keep matches in your pocket for this latest internet hoax.